A pedestrian has died and a motorcyclist has suffered serious injuries in a crash in Bournemouth. 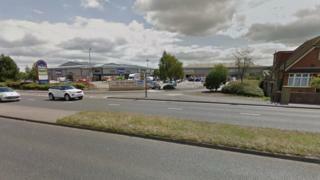 A 74-year-old man, from Poole, died after he was hit by a motorbike while crossing Ringwood Road, near Turbary retail park, at 14:30 BST on Sunday. The 50-year-old motorcyclist, from Ferndown, is in hospital with serious but not life-threatening injuries, Dorset Police said. Officers are appealing for witnesses and dashcam footage.